Dig into any worksite with the power and versatility of the digger attachment. Like a shovel, the digger attachment can be used for applications such as landscaping and moving greenery. But because it is mounted on a loader, the digger attachment works much faster, saving time and energy. The digger attachment can dig in both forward and reverse, which adds versatility while increasing jobsite productivity. Dig Depths: Built for versatility, the digger attachment features two maximum dig depths; available with 27- or 48-in. depth. 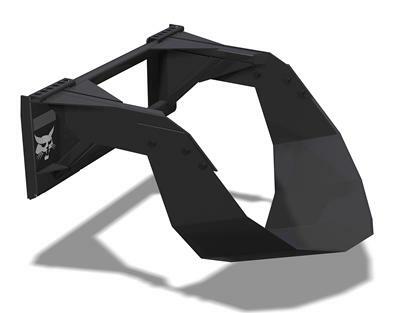 Digging Direction: Designed for a variety of applications and maximum productivity, the digger attachment functions both in forward and reverse. Multiple Widths: To increase jobsite capabilities, the digger attachment is available in five widths, ranging from 12 to 36 in. Versatility: Handy for a variety of applications, the digger attachment is a versatile tool, excellent for working on jobs such as trenching and loosening hard-packed soil.